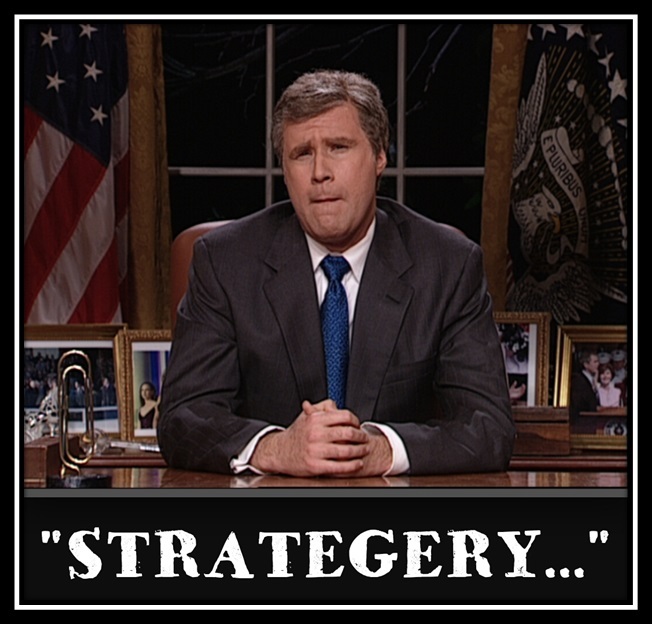 Strategery is a comical word said by Will Ferrell on Saturday Night Live while playing candidate George Bush. Voting with a strategy is no laughing matter for Blacks in the South. As we know, most Black southerners who vote favor the Democrat Party however, I stay ticked off by the fact that many Blacks simply don’t vote. Oh, hard working, church attending, clean nosed African Americans vote as part of our civic duty and to help form a more perfect union. But, a shocking percentage of Blacks who live in part on public assistance can’t be troubled to go vote. But, the same folks pay 8 bucks every Friday night to profile at the high school football game…in the cold….for hours. Really? If those folks voted, the Republicans wouldn’t run most of politics in the South outside the largest cities. Strategery would dictate that Blacks Who Actually Vote (BWAV) come up with a fallback plan because begging cats to vote isn’t working. The purpose of voting is to select elected leaders who best reflect your views and opinions. So logically, if the Democrats aren’t even fielding candidates in most contests, we must select from the Republicans…I won’t say “the lesser of evils” because most of them aren’t actually evil and I have yet to see any horns. Georgia has a special election in December in State Senate District 20 and Mrs. Vivian Childs is a candidate. You won’t meet nicer people than Mrs. Childs and her retired colonel husband Henry. They are deeply involved in the Houston County/Middle Georgia community and raised outstanding children. Let’s talk about trump but not about presidential candidate Donald Trump. I mean the fact that candidate Childs’ membership in a prominent African American sorority “trumps” the fact that she is a Republican. Yes, DST trumps GOP with me because we are cut from the same cloth and have a shared cultural history. This blog often points out many southern Blacks are conservative in actuality because we think success comes from personal actions rather than governmental involvement. Yes, the government should protect basic civil rights but the safety net has created a softness with citizens of all colors. Of course, the far Right trips so hard that they have ensure that Blacks aren’t comfortable joining the GOP until the traditional conservatives retake the ship….that won’t happen soon. But, putting a reasonable, positive person like Vivian Childs in the state senate would be a step in the right direction. Mrs. Childs’ career always involved helping people through education or ministry. District 20 Democrat voters should vote for one of the GOP candidates in this non-partisan election and Mrs. Childs is a wise move. Donald Trump got rich in business by using leverage and the Black community has little leverage in state government these days because we are overwhelmingly with the losing team. What the heck is the Black presidential plan relative to Donald Trump in the South? Hillary is the Dem nominee and that reality frees us up for strategery in the GOP primary. First, the Republicans hate it when Democrats vote in the GOP primary so I like that…let their heads explode but I want to vote where the action is. We could vote for Donald Trump or Dr. Ben Carson because Hillary would have an easier time whupping them next November. But, what if they actually won?! As we say on my block, “don’t even play like that.” The GOP nom needs to be a serious leader with a proven history of governing…a big state governor. While Chris Christie is a “big” state governor who can lead, I mean a governor from a “big state” like Florida or Texas. With Rick Perry gone, Jeb Bush is the guy and Ohio Governor John Kasich should be his running mate. Bottomline, Black folks need to get behind Vivian Childs, Jeb Bush and John Kasich because the stakes are too high to let the GOP voters decide alone.